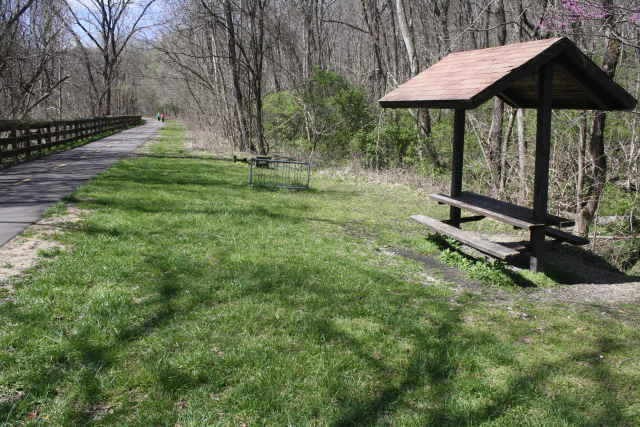 The Little Miami Scenic River Trail in Milford, OH, is a stop along the 50 mile Little Miami State Park, a corridor park that runs from just south of Milford to just south of Xenia, OH. It may not be a nature walk through the woods, but the experience is active and scenic, making it a great place to stretch your legs and lift your spirit. 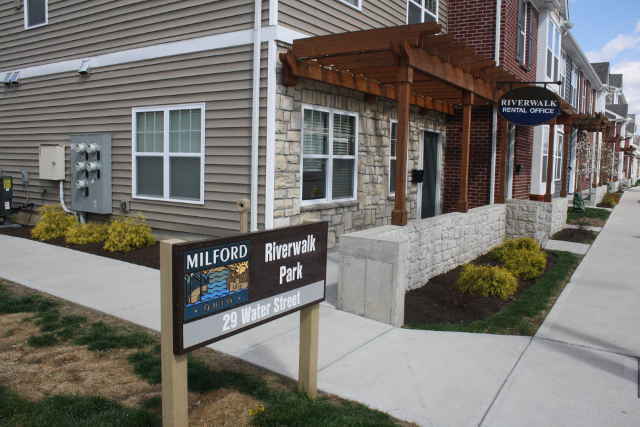 Located right across the bridge in Old Milford, at the intersection of U.S. 50 and Glendale-Milford Road, it sits on the hillside where it is identified as the ‘Milford Trailhead,’ and is a multi-purpose trail for bicycling, walking, jogging, and even horse-back riding. We walked on Saturday, April 2, 2016, at 12:00 noon. The temperature was 50 degrees, and it was windy. We parked at the Miami Bike Trail entrance where Bishop’s Bicycle Shop was located. There were information signs showing the trail and other stops, and we choose to walk on the trail going to the right. 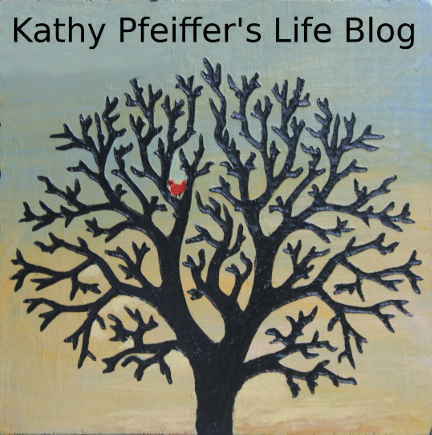 The path was wide, paved with asphalt, was in excellent condition, and had a yellow dashed line down the middle of the path, separating the lanes where traffic, both on foot and on bicycle, flow in opposite directions. Cyclists and walkers enjoying the trail..
We noticed songbirds immediately as we began walking, staying to the right in our lane, as we were warned by other walkers, so bicyclers could pass. The side of the trail to our left was mostly wooded, going up and down hillsides, while the side on our right followed Glendale-Milford Road below it, and was bordered by a wooden fence for most of the trail. The great condition of the trail made for some fast walking, and we reached one mile on our pedometer before we knew it. At about the 7/10 of a mile mark, there was a picnic bench and bike rack beside a babbling creek. There were also many wild flowers and early blooming trees which made the walk just lovely. We headed back when we reached one mile, making for an easy two mile walk, and then enjoyed the shops and restaurants on Main St. in Old Milford, just across the bridge. A great way to mix fun and exercise. Restrooms: There were two large port-a-potties at the parking lot. Traffic Noise: Since the trail runs just above Glendale-Milford Road, you could hear traffic noise throughout the walk. Interesting Features: It is uniquely multipurpose, so can be easily shared with everyone from your little one in a jogging stroller to the family dog to a bicycling buddy. If you are renting a bike, be sure to call Bishop’s ahead of time to make sure they are open at the trail location. Historic Points Of Interest: The Little Miami Scenic River Trail is built on the path of the old Little Miami Railroad. 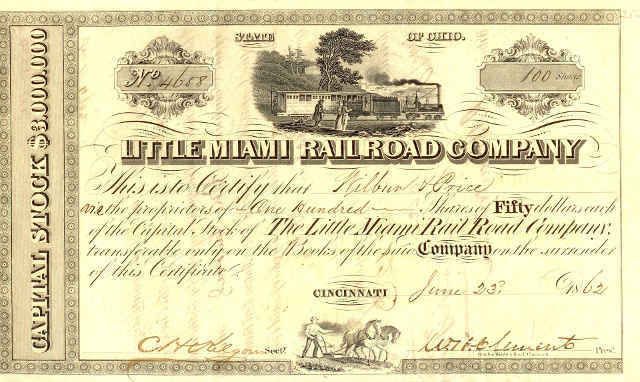 The second railroad to be built in Ohio, the Little Miami had arrived in Milford in 1841, just beginning their march to take over commerce from their water born brethren, the canal boats. 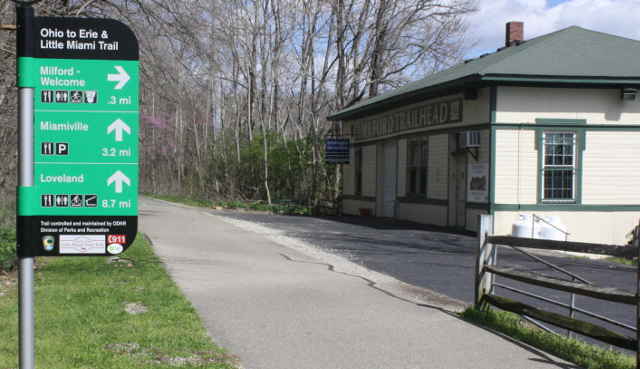 The first train to Milford arrived on December 14th, 1841, and the tracks were laid to Loveland the next year. 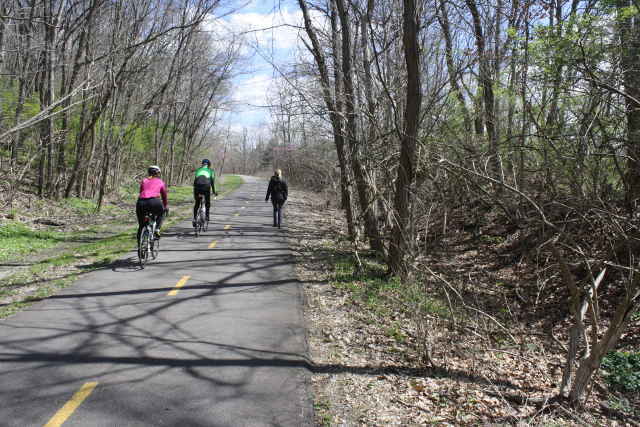 The Railroads had a tumultuous history in the U.S. and eventually the Little Miami Railroad was merged out of existence by 1981, the tracks were pulled up, and this right of way became the Little Miami Bike Trail. Overall Rating: It was a very enjoyable walking experience. Sharing the trail with bicyclers and joggers didn’t stop us from communing with nature, as we just smiled, said hello, and continued soaking in the scenery. Topping the day off with a stroll down Main St., including the new Riverwalk Park, made the whole experience refreshing and fun. Yes, maybe we can even rent bikes!